The transepts, crossing and lower tower were built between about 1125 and 1140, followed by a mid-C12 nave of which less than a bay remains. The upper tower followed shortly after and the choir was rebuilt, probably between 1180 and 1210. Despite many puzzles, it contains some of the finest work of the period in England. Documentary evidence suggests that the church was probably started between c1125 and c1139 (quoted in www.crsbi.ac.uk retrieved on 15/4/2013). It was planned on a large scale, almost certainly on a new site, but despite the interest of the de Braoses (see Introduction), they were probably not the main providers of funds. These came rather from port dues (9 p90), which also covered much of the cost of a more ambitious choir within 60 years of the building of the first one. Construction started with the first choir, followed by the crossing and transepts. Excavations in 1915 revealed that this choir was aisleless with two bays and an apse (3 p79). 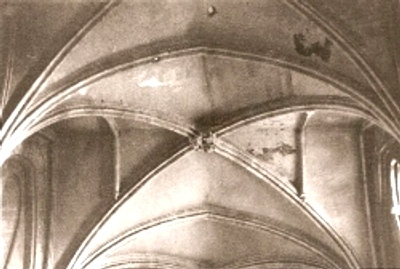 On the east side of the crossing arch a roof-line shows it was the same height as the transepts and thus lower than the present chancel, as well as narrower. Three crossing arches have round heads with three plain stepped orders and all have responds of four shafts and scallop capitals (i e around 1130-40), with intertwined leaves and winged beasts. The transepts originally had steeper roofs, as is apparent from the lower stage of the tower. Most of their round-headed windows are set high, with recessed and shafted rere-arches. The south gable has three blind arches, of which only the middle one is complete. Three of the window-heads in the south transept have chevron mouldings, a sign of mid-C12 work. Only to north and south were there windows at a lower level (all later replaced), for there were chapels on both east sides, of which outlines remain. They were removed when the choir was rebuilt and it was assumed in 1915 that, like the first choir, they were apsidal. However, further investigation in 1950 did not confirm this (ibid). The nave was higher, as the taller western crossing arch shows. Woodcock suggests this was heightened after being built (13 p95), but there is no sign and more probably it was altered at an early stage during construction, for the roll-moulded west side of its head would not be out of place in the 1130s and is likely to be little later than the other three arches. It must logically predate the tower and is contemporary with the now blocked arches from the transepts into the nave aisles. The centre moulding of the main arch is decorated with what look like two facing rows of battlements, each with a V-shaped indentation. The heads of the aisle-arches are plain (they were less conspicuous than the crossing), but the shafts on the responds have foliage-capitals. The lower stage of the tower followed, though to be in scale with the rest of the church, an upper one would have been needed from the first. Its corners are shafted and on each side two round-headed, roll-moulded and shafted outer openings contain two smaller ones, separated by shafts with cushion-capitals. Only part of the first bay of the nave survives, converted into a porch, but enough remains to show the arcades had heavy, round piers, scallop capitals and triangular mouldings on the labels of the round heads. The north clerestory window has a shafted outer arch; that to the south has been altered. When adapted as a porch, some stones with beak-head were re-used in the entrance-arch, which also has shafted jambs. These presumably came from elsewhere in the nave, possibly its west doorway, and, like the other detail, suggest a date not before c1150. The nave had lean-to aisles and was probably built over a period of time, but little is known of it, though R C Carpenter believed it was not vaulted and the excavations of 1915 revealed six bays (VCH 6(1) p170). Undecipherable lumps of stone mark the west end. The slightly recessed upper stage of the tower followed soon after the nave was started. Arranged in the same way as the lower part, the tall outer arches of the paired openings are now pointed, though subdivided into three narrow round-headed ones. Above are circular openings in the corners and a corbel table. Though the top is now flat, there was originally a spire. The rebuilding of the choir may have started before the nave was finished. Puzzling and complex, it has been studied by Sharpe (who had no connection with the Sharpe Collection), many of whose observations remain valid, and by Nairn, Roberts, Gem and, most recently, Woodcock (see 13). Most writers have sought to establish a sequence of building that made sense of the differing parts. Thus, to take an example, Y Kusaba (quoted in L Hoey (JBAA 139 p65 note 73)) suggested that the south arcade predated the north one, but that goes against what is known of mediaeval building sequences, which usually ran from east to west with both sides being built in parallel. However, Woodcock offers an alternative and more pragmatic solution, based on a conscious acceptance of variations in form that may seem strange to later eyes, accustomed to notions of symmetry derived more from classical architecture. This approach is followed by Peter Draper (p97) who sees the late C12 as a period of ‘lively experiment when variety was clearly prized for its own sake’. This could sometimes lead to a ‘striking lack of concern for consistency and symmetry’. The first question is the date of commencement. The round-headed blind arcading in the aisles, with varied capitals and mouldings, and a shafted, round-headed window near the east end of the north aisle, all suggest the 1160s. However, Woodcock, noting the distortion of the stones, proposes that the arcading is reset, possibly from an earlier abortive rebuilding (13 p95). This would permit the starting date to be advanced to the 1180s at the earliest, which is what the rest of the detail suggests. The east responds of both arcades are similar, with separate shafts in line, confirming that both sides were started simultaneously. Recurring similarities of detail, noted already by Sharpe (p19), strengthen the supposition that they were built in step, despite differences in design and there is evidence of an intention to vault aisles and choir from the start. 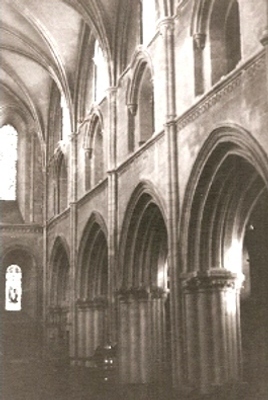 Though the heavy flying buttresses, with under-sized finials, are not bonded into the aisle walls and could have been added later, as Sharpe believed (p32), this does not mean the vault was a later change, for like the relieving arches in the galleries inside, the buttresses could well have been added to strengthen the structure. The intention to have vaults would be further evidence of a starting date after c1180. A vault would have been less likely around c1160, but by the 1180s there was one at Chichester cathedral, with which New Shoreham shares other details. The quadripartite aisle vaults, with roll-moulded ribs and small foliage-bosses (including three with a green man in the south aisle), may have been complete before the upper parts were started. This accords with Sharpe’s hypothesis of two building phases, horizontally differentiated (ibid). The triple shafts on the outer walls, with stiff leaf capitals, also look late C12 and are closest to the lower parts of the arcades. The stiff leaf capitals on the alternating round and octagonal piers of the north arcade, with an outer order of foliage, recall Canterbury. Either they were the work of masons from there or there was influence from Chichester, where Canterbury masons are known to have worked after the fire of 1187. The mouldings of the pointed arches are finer than those of the south arcade, where the piers have clustered shafts, each with a stiff leaf capital. The innermost ones rise to the vault and, as the date differs little from the north arcade, despite the differences, are further confirmation that a vault was intended from the start. The variation of forms characteristic of New Shoreham is most evident in the gallery, beneath which is a continuous band of quatrefoils that does not vary. Earliest are the single eastern bays on the north side, which have moulded trefoiled heads and shafts with more stiff leaf. The remaining three bays have double openings. Like the openings of the south side, they have hook-corbels at the outer corners. These are a New Shoreham characteristic; not perhaps the happiest of designs, it is commoner in Normandy than England. Here, they contrast with the inner capitals, which have foliage, and there are two more at the springing of the vaulting shafts on the north side. The uniformly single openings on the south side break the sills of the clerestory. Their moulded heads rest on hook-corbels, but these are an afterthought, since at the base of each arch is the foot of an intended shaft. The clerestory both sides consists of single lancets. They differ in detail, for to the south they have tiny capitals on hook-corbels, though the presence of bases shows that, like the gallery, shafts were first intended. The vault is similar throughout, except for some details, for example the small liernes in the second bay that are linked to the main ribs by small hook-corbels, which are the latest appearance of these at New Shoreham. The three tall east lancets have sloping sills and shafted rere-arches, with rings and stiff leaf capitals. Outside, there is a band of quatrefoils beneath them, like that under the gallery. Uniquely at Shoreham, this wall is faced with Caen stone. Ian Nairn (BE p281) suggested by analogy with Chichester that the distinctive work at the north east corner at gallery level (and therefore everything above it) dates from after 1230, but building is unlikely to have gone on so long. Nothing else suggests a date much after 1210, the latest likely date for the arches from the aisles into the transepts. These were inserted in the existing walls and resemble the north arcade, with the addition of dogtooth moulding. Thus, probably by the early C13, New Shoreham was complete. Later changes did not go beyond new windows, starting with the large C13 lancet in the lower part of the north transept. An early C17 carving of the church in the town hall shows an apparently C14 west window and a large C15 south porch, the foundations of which were found in 1915. The north transept has a late C14 two-light square-headed window and Green’s engraving (6 opp p75) shows similar, probably C15, ones in the south transept. The Sharpe Collection drawing (1802) shows some aisle windows, especially towards the east, were C15 or post-Reformation. Inside the only significant change was the building of a rood above the east responds of the nave, probably in the C15. The early C17 carving is evidence that the nave still stood then, though Gem suggests it went during the decline of the port in the C15 (5 p75). In the absence of any record, the most likely occasions are a French raid in 1628, the Civil War, when there was considerable activity in the area, or a storm in 1703. Any of these would be consistent with repairs in 1714, for which a brief was issued (VCH 6(1) p171)’, though the most recent date might seem most likely. These repairs presumably included the conversion of the stump of the nave into the present west porch. The church received much attention in the C19, starting with an abortive proposal to rebuild the east end in 1808 (5 p76). In 1829 S H Benham replaced the pews and added a gallery at the west end of the choir (ICBS), which had gone by 1852. A round-headed window was inserted in 1832-33 under the east lancets in the central of three wall-arches (8 p263), which Sharpe believed had originally been windows (p18). Otherwise, Nibbs’s undated etching (published in 1851) shows that there has been relatively little subsequent change beyond the replacement of the aisle windows, though the church appears run down. In 1853-54, Nathaniel Woodard, then curate, instigated plans to rebuild the nave to a design by his close friend R C Carpenter (Eccl Aug 1854 p287). He was then distracted by his educational projects, in which Carpenter and his successors were also much involved, and only in 1865 was a committee set up to raise funds. Carpenter was dead and in the following year his erstwhile partner, W Slater, and son, R H Carpenter, (ICBS) were invited to do the work, using the existing plans. The scheme was unpopular in the parish and was abandoned in 1869, as only a quarter of the necessary £10,000 had been raised (B 27 p270). A restoration of the existing fabric was undertaken instead. There was much controversy in the professional press, as initially no architect was employed and then only a little known local one, A Loader. The debate illustrates contemporary attitudes, but had little effect on the outcome. Work started at the east end in 1874, financed by an anonymous local benefactor and carried out by someone described as an ‘ignorant bricklayer’, who was said to be secretary of the restoration committee (B 32 p1081), but is also nowhere named. There was particular concern over the use of cement to patch stonework and the replacement of the wheel-window in the east gable, admired by Pugin (ironically, this was again replaced in c2006 (church website)). Among the protesters was Loader (ibid), who by 1876 had somehow assumed charge (WSRO Ep II/27/231). The controversy did not end and some protesters assumed that Loader was the bricklayer. Only after Edmund Sharpe (see under Paley and Austin) had made an inspection behalf of the RIBA (BAL Add MSS LC 14/7/12 (later printed)), did his generally favourable report, delivered a few weeks before his death, end the debate. The work, undertaken in stages, ended in 1881 (A 26 p385). 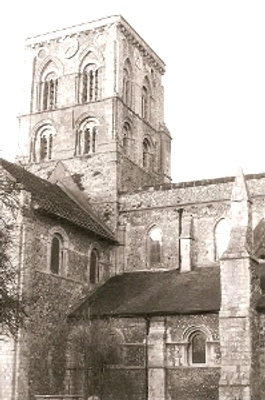 Loader’s work was acceptable by the standards of the day, though Sharpe criticised his new aisle windows, which, on the mistaken assumption that construction started by 1160, copied a surviving round-headed one in the north aisle. Loader treated the interior carving with care, as the recent discovery of extensive remains of C13 paint confirms (see below). 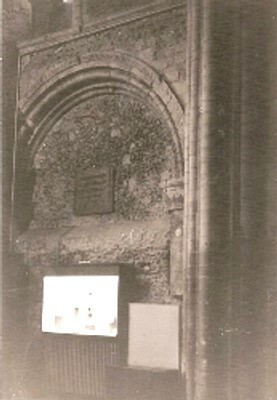 A statement by Mee (p336) that the chalk (i e the infilling) of the high central vault was renewed is doubtful, since he only made it in the 1930s and gave no contemporary reference, and also because the advanced decay that became evident in recent years (see below) would have been less if it had already been renewed. Loader left few old fittings, though many had already gone. Outside, he opened up various blocked clerestory and tower openings and replaced later patching (B 35 p140). In 1895-96 the tower was found to be damaged by subsidence and after a report by Sir A W Blomfield, B Ingelow restored it further (Arch J 1 p324 and 381). He had replaced Slater as partner of R H Carpenter, who himself was dead by then. In 1924 (8 p263) the side-arches at the east end were also opened up as windows and a supposedly later parapet was removed. The architect may have been W D Caröe, who is known to have worked here around this time (Freeman p162). Denman and Son undertook repairs in 1967 (ICBS), but more dramatically, Carden and Godfrey (R Andrews and R James) between 2003 and 2006 (12 p30) reconstructed the main vault. This was necessary as the chalk-infilling (the web) had largely disintegrated. The ribs were re-used and the chalk was taken from the same quarry as the original (for a fuller account see 4). The central boss, which had previously been plain, was carved with emblems linked to the church and the date (church website). 1. (East end of south aisle) Early C17 with big balusters and clearly cut down to fit this space. 2. (North transept) Plain and arranged as a semi-circle. They date from c1700 and were donated when this part of the church became a war memorial chapel in 1947 (Watney p58). Brasses: (South aisle) Small effigies of a man and woman, c1450, belonging to the London workshops, Series B. Though the man is unknown, Jerome Bertram (TMBS 17/6 p610) has suggested that he could have been a local merchant, possibly one of the 10 or so Members of Parliament returned for the town in the preceding period. Font: C12 and a variant on the standard type, consisting of a square marble bowl with stylised foliage carved in the spandrels of the top. Only the west and north sides are arcaded and there are variations from the norm; to the west the columns are twisted, though to the north the arcading is more conventionally pointed. The east side has semi-circles containing decoration and the south one four circles containing Maltese crosses. The corner shafts have capitals, merging with the top of the large central stem; some of these have been renewed. 1. (North transept, upper window) T Willement, 1858 (Willement ledger). 2. (North chapel north window and north aisle, first to fourth windows) Heaton, Butler and Bayne, 1873-75 (B 35 p140). 3. 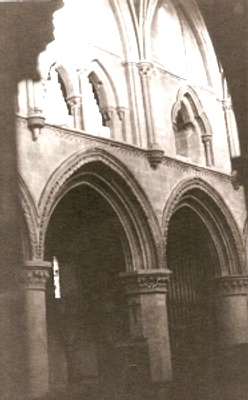 (North transept, north window) Cox and Son, 1877 (ibid p331). Grisaille work. 4. (South chapel, first and second windows) W G Taylor, 1884 and 1889 (www.stainedglassrecords.org retrieved on 18/3/2013). 5. (North chapel, east window) W G Taylor, 1889 (ibid). Now largely concealed by organ. 6. (Lower east and north transept, east windows) Kempe and Co, 1923. 7. (Tower, south window) Goddard and Gibbs, designed by D Smart, 1955 (WSRO Fac 504). Monument: Robert Hooper (1835?) by H Hopper (Roscoe p641). Painting: During the insertion of the new window at the east end in 1832 (see above), a wall-painting with figures was found within the wall-arch, but was not preserved (11 p95). It may have been linked to the extensive remains of painted decorative work, some on arches and capitals, found in the chancel during the restoration work of 2003-06 (ibid passim); some traces had been noted in 1876. There appear to be two overlapping schemes, both dated to the early C13, when such decoration became popular, though little is coherent. The date accords with that assumed for the completion of the chancel. 1. (South nave wall) Probably C15 and pointed. It was for the rood-loft and shows its position well above the floor-level. 2. (North transept) C13 trefoil-headed. Pulpit: Stone and arcaded, by Ingelow, 1905 (CDG 134 (1905) p16). My thanks to Josie Campbell (JC) and Richard Standing (RS) for making the colour photographs available.